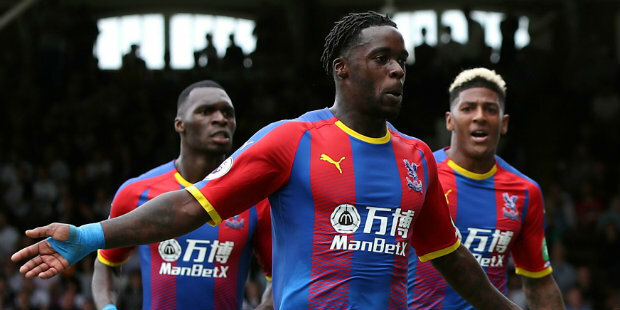 Crystal Palace’s Jeffrey Schlupp hailed his understanding with Patrick van Aanholt after scoring his first goal for the club in Saturday’s 2-0 victory at Fulham. Schlupp’s fine finish gave Palace a half-time lead, before Wilfried Zaha later secured all three points at Craven Cottage, after being put through by Van Aanholt’s fine through-ball. The latter was also denied a similarly good goal when his first-half finish was ruled out for offside, but he showed consistent signs of developing a promising partnership with Schlupp on the left wing. They had been expected to remain rivals to be the club’s first-choice left-back, but Roy Hodgson has instead retained Van Aanholt there and started Schlupp in front of him on the left wing. Their combination will potentially provide greater width after the loss back to Chelsea of Ruben Loftus-Cheek, and Schlupp told Palace’s official website: “Patrick and I have a great understanding down that left-hand side. “The moment he got the ball there was a bit of eye contact for me to show him where I wanted the pass and he played it perfectly and I just had to concentrate on hitting the target, it went in so I am happy. “You could see how much it meant to me with the celebration and what a time to do it, I have waited a long time and enjoyed that one. Be the first to comment on "Schlupp hails ‘great understanding’ with Van Aanholt"